A touch of world-class dinner is waiting for you at the Chaophraya Cruise. You have to book your seats early to get a better place to enjoy the scenic beauty around the cruise. The buffet will be opened, once than cruise sails for few minutes. The staffs are very friendly. You will get a shopping mall inside the boat. You will enjoy the live concert here while pacifying your taste buds. The best part of this journey is that you will be able to enjoy the great view of the city from the middle of the river. Personalize your visit to the city by chalking out a plan using Bangkok trip planner. Fine Accommodation options like Kokotel Bangkok Surawong, Icheck Inn Silom and Amber Boutique Silom will meet your requirement of where to stay in Bangkok. Generate executable plans on your own or book the top rated Bangkok vacation packages for your visit. Read more on how to reach Bangkok. How popular is Chaophraya Cruise? 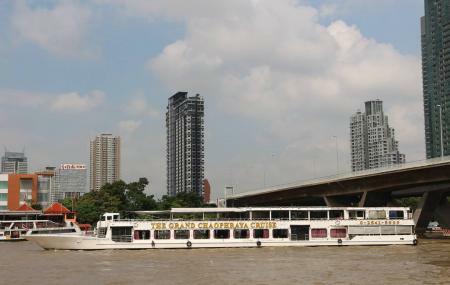 People normally club together Yaowarat (chinatown) and 7-eleven while planning their visit to Chaophraya Cruise. I loved the ambience and the food. Really good. You should not miss this if you are in Bangkok. When the cruise sails on the river, you will enjoy the night view of the surrounding buildings, restaurants and temples. You will get to see bridges while sailing. Value for money I would say. How can I forget to tell you about the music! If you are an Indian, they give you a special cruise I guess and the anchors would sing hindi songs with music for you to enjoy and dance. I loved this cruise. Being an Indian, I was worried if i would get a good Indian food in Bangkok. But this cruise proved me wrong. The food was awesome here specially Indian Veg. Lot of variety was there and the view from the upper deck was awesome. Staff was supportive and polite. Loved this experience. Nice cruise. Indian food could have been better. Hospitality needs improvement. 1st floor is much better. Ground floor was boring. If u prebook... Go for top floor. We had a great time. The food was fabulous and plentiful, the entertainment was lively and engaging, and the wait staff was friendly and helpful. We sat at table on the forward deck and had a perfect view of all the riverfront sights. Money well spent.